Except for a brief period of reading Christopher Pike novels when I was twelve, I have never been a mystery or suspense fan. I'm not sure why. I guess because I wasn't interested in the particulars of a detective solving a mystery or hearing about another woman's brutal murder being investigated. It just wasn't for me. Even romantic suspense novels really didn't do it for me. But over the last couple of years, I have been exploring the genres a bit more--both mystery and suspense. I started with cozy mysteries about thirteen years ago and became a fan of the Coffeehouse mysteries. (Though I haven't read all of them.) I like cozies because they remind me of small-town romance, and those are...well...cozy. But I still didn't pick up a real mystery until over the last couple of years. I finally read my first Agatha Christie novel this year! I have found that there are types of mysteries/mystery tropes I really like--and And Then There Were None hit all of the right buttons for me. I love having people in a closed setting where they are forced to interact--especially if those people are hiding something. (It took me back to my love of The Westing Game!) I read a few more Agatha Christie books like that, and then I started exploring some of the suspense books I began to see at the book store over the last couple of years. But one day I saw Gillian Flynn's Sharp Objects on sale, and I decided to get it. I just read it last week, and I LOVED it. (See last blog post.) Now I am on a psychological suspense kick. 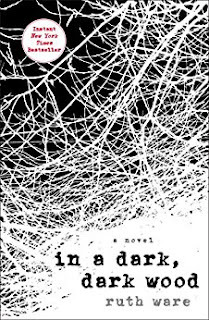 My latest read was Ruth Ware's In a Dark, Dark Wood. I have seen various reactions to this book: some loved it; others hated it for its predictability. I'm in the camp that liked it. Some of it was very predictable. But there were one or two details that surprised me and kept me guessing. I also liked the characters. They weren't "likable" people, but they are interesting as characters. The book has everything that makes me happy: a closed, intense environment; a finite time span; creepy characters with secrets. I really enjoyed Ware's writing style, too. I found the book to be an easy read, and I fell into the prose quickly. From what I understand from other people's comments, this is Ware's first book. For a first book, if this is indeed the case, she has a great mastery of voice. Nora is a tortured character with a lot of faults, but these faults are subtle and reveal themselves in her interactions with the other characters. So, yes--showing but not telling. I love character-based plots, and though this one also had action, the crazy characters made it work for me. In any case, I am going straight to Ware's next novel: The Woman in Cabin 10. I will keep you posted!